Combination of both net giants Google+Facebook application allows users to see Facebook streams and update & statuses from Google+ platform itself “bringing in Facebook within Google+”. 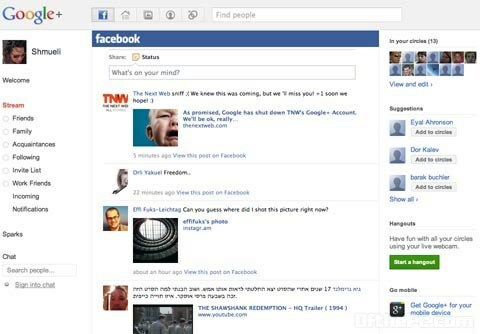 Supports Firefox and Chrome users, this brilliant combination of Google+Facebook was developed by Israeli developer Crossrider. Menachemi founded Crossrider a year ago along with Shmueli Ahdut the developer of Google+Facebook. , that violates Facebook's terms of service. This application just adds Facebook icon to Google+, where users can view their Facebook pages. "It's something we created in less than a day," Menachemi told Reuters. "The product is not perfect, yet you can view (Facebook) streams and update your status" while on Google+. "It's a site within a site,"
"If users want a feature to post updates on both networks, we will. If they want to comment on their Facebook screen, we will do it." Menachemi who noted that the popularity of the Google+Facebook application has been higher than expected, denies that Google+Facebook is malware as there has been some criticism of the application calling it "malware" -- or malicious software. Google which has more than 750 million in the rapidly growing social networking industry, directly compete with Facebook, Google+ betting, which already has more than 10 million users.